Welcome to the Music from the Genome website. MftG is a unique project funded by the Wellcome Trust. It comprises two elements, both unprecedented. In the scientific part, we studied the genetic characteristics of choral singers. We were interested in parts of the genome that relate to natural communication between brain cells - principally communication influenced by the substance serotonin. 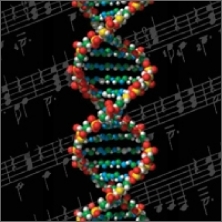 We compared the DNA (deoxyribonucleic acid) of 261 choral singers with that of 258 non-musicians. We found that choral singers were more likely to have particular variants of the SLC6A4 gene than were non-musicians. For the musical part of the project, the results of DNA analysis from 40 members of the New London Chamber Choir were used to create a major new choral work, “Allele”. Allele is the name given to alternative forms that can occur at parts of the genome that differ between individuals. The text of “Allele” was written by the poet, Ruth Padel, and the music by Michael Zev Gordon. Each singer’s musical part was created using the results of their own personal genetic analysis. They are, in effect, singing their own genes. Allele was first performed on 9th July 2010 at Diamond Light, the UK National Synchrotron Facility, in a concert presented by Oxford Contemporary Music and Oxford Inspires. The singers of the New London Chamber Choir were directed by James Weeks. A recording of this performance is available using the audio player on the right. A subsequent performance at the Cheltenham Music Festival was broadcast in the UK on BBC Radio 3 on 25th September 2010. Allele subsequently won Michael Zev Gordon the 2011 BASCA Composer of the Year award (choral section). The Music from the Genome team is: Dr Andrew Morley (director), Michael Zev Gordon, Ruth Padel, Professor Ian Craig, Dr Gavin Craig, Professor Cathryn Lewis and the New London Chamber Choir. The text of Allele can be viewed by clicking on the website menu above and scrolling to the relevant item. Also available are a summary of the scientific findings, together with articles by project members about genetics, music and the creation of the choral work. The audio player will load in a pop up window so that you may listen to the duration of Allele while perusing this website.